The complete six-part BBC series from Aardman Animations is in the works for Blu-ray this March. 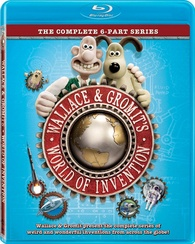 In an early announcement to retailers, Lionsgate is preparing to release 'Wallace & Gromit's World of Invention' on Blu-ray on March 13. 'Wallace & Gromit's World of Invention' sees world-renowned inventor Wallace and his faithful sidekick (turned camera dog) Gromit turn their hand to presenting for the very first time, hosting a six-part series from the basement of 62 West Wallaby Street. They take an enthusiastic look at some real life cracking contraptions, from gadgets that help around the home to the mind-boggling world of space travel and much more in between. Specs have yet to be revealed, but supplements will include: Your World of Invention - a featurette on building "cracking contraptions" at home. You can find the latest specs for 'Wallace & Gromit's World of Invention' linked from our Blu-ray Release Schedule, where it's indexed under March 13.